Indian Rajya Sabha MP and former Samajwadi Party leader Amar Singh seems to be seeking spiritual healing for various troubles (example – tape scandal). 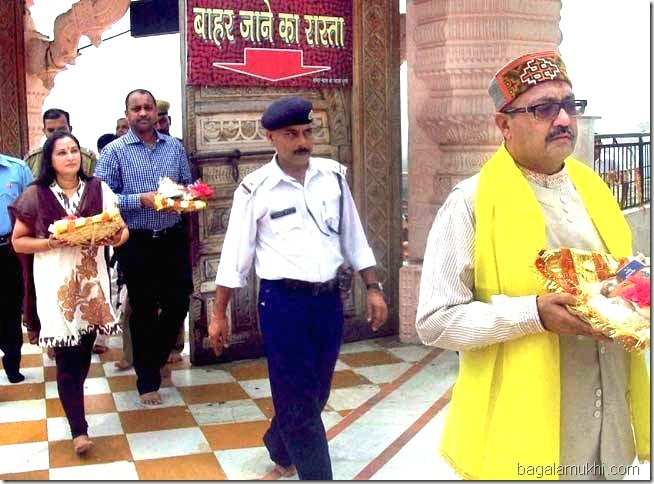 Amar singh along with actor-turned-politician Jaya Prada offered prayers to the Tantrik temple of Goddess Bagalamukhi at Bankhandi near Dehra. Pooja of Maa Baglamukhi is done to immobilise the evil forces and reduce the strength of enemies. Amar Singh is facing allegations of bribing Bharatiya Janata Party (BJP) MPs in an effort to save the Congress-led central government in the 2008 trust vote. The leaders spent nearly an hour to worship in the temple. The temple priest Manohar Lal told that the leader Singh performed pooja for Shatru vadha and Raj Darbar. He also did another pooja in the temple premises. Maa Baglamukhi is considered to be the eighth manifestation of Lord Vishnu. Later, they paid obeisance at Jwalamukhi and Chamunda Devi shrines in this district.